One of the best things to do is eat. But it’s a lot more fun when you get to eat holiday snacks and treats, because making them is even more fun, and surprisingly easy. During these past two days I’ve made a handful of treats that I’ll share with you. Everyone loves chocolate, and almost everything goes good with chocolate. One of the simplest treats you can make are chocolate covered pretzels. All you’ll need is chocolate melts, pretzel rods or regular pretzels and anything you want to use to decorate them; I used white chocolate. All you need to do is melt the chocolate in either the microwave – mixing it every 30 seconds – or in a double boiler. 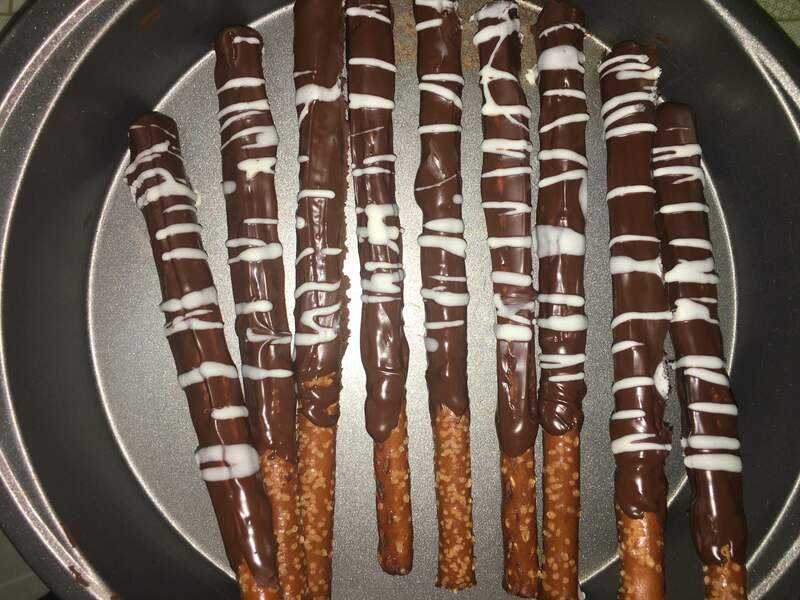 Once you have your chocolate melted you want to dip your pretzels in it and set them on a cookie sheet covered in either wax paper or aluminum foil. If you choose to decorate your pretzels, you can add sprinkles or white chocolate to create stripes, but remember that you want to do it before the chocolate completely dries. I think these are the easiest and quickest treats you can make. Something else you can make is Christmas tree Rice Krispy treats. They take a little more time but the end result is worth it. You’ll need the rice cereal, marshmallows, butter and green food coloring. First you need to melt your butter on the stove, and once the butter is completely melted you want to add your marshmallows and mix it until the marshmallows have been completely mixed in. Then, add the green food coloring and take the mixture off the stove. Start adding the cereal to the marshmallow mix and mix until well combined. Let it cool a little, but not too much, and then put a little bit of butter on your hands and start forming the mix into the trees. If you want a little extra something, you can add red M&M’S to act as ornaments. Let them cool for about an hour, or less if you put them in the fridge. These are just a couple of the treats you can make for the holidays, and if you wrap them up in a cute bag and twist tie, or a Christmas box, you can also give them as a little present.